Personal injury claims can be serious and often involve a variety of different injuries, injury types, and severities which occur to people from across the country. At Legal Expert, we are the UK’s premier resource for information on personal injury cases, compensation claims and how to make a successful no win no fee compensation claim. The solicitors we work with across the country will have years of experience in helping people to make a successful claim after injuries such as serious facial scarring, whether from a surgical accident or other cause. In this case study, we look at the case of a woman who had suffered serious facial scarring as a result of plastic surgery she had received several years prior to the case for facial Scarring compensation being brought. A total of £80,000 in serious facial scarring compensation was awarded to the claimant in relation to the ‘unsightly after effects’ she was left with after a cosmetic surgery procedure as well as the overall unsightly scarring. In this case, the defendant was a private clinic which provided the initial surgery and whom the claim was made against. The case was resolved out of court for a total of £80,000 in compensation. The professional team at Legal Expert, as well as the dedicated no win no fee solicitors whom we work with, have helped claimants across the country to claim the compensation awards that they are owed after an accident. To find out more about the serious facial scarring the claimant suffered in this case, and how it was successfully resolved, as well as how much facial scar settlement amounts can be, read our case study below. How Common Is Scarring From Cosmetic Surgery? In the UK the number and frequency of cosmetic surgery procedures performed has increased markedly over the last two decades. It is still rising each year and it has been estimated that today there are over 100,000 cosmetic surgery procedures performed by both NHS and private surgeons and practices across the country. The rise in the number of men using cosmetic surgery has contributed greatly to the overall increase in the number of procedures. At the moment there are not any official statistics on the number of people who have been left with injuries and the need to make a permanent facial scar compensation claim in the UK. Cosmetic surgery is a very varied and wide-ranging term encompassing numerous procedures. 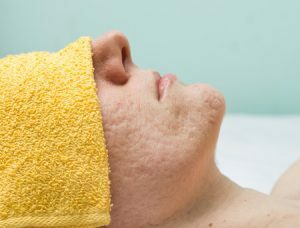 Some of these, which could lead to facial scarring, including cosmetic surgery to the eyelids, chin, ears, nose or face, skin resurfacing or a forehead lift. Any of these surgical procedures could cause facial scarring and lead to a claim for facial scarring compensation. As with any type of surgery or medical procedure, cosmetic surgery does carry some risks with it, these could include complications or errors with aesthetics. If you have been affected by this, you may be entitled to claim permanent facial scar compensation. In our facial scarring case study, the claimant was a woman being treated at a private clinic. She intended to have wide-scale cosmetic surgery on her face. At her initial consultation, she enquired about the safety of the procedure. The woman was shown photographic evidence of successful surgery performed on previous patients, with before and after images. The woman was shown no evidence of visible scarring in the photographs shown. The claimant was informed that her surgery would be safe and that she would be left in the same condition as the images shown, with no visible facial scarring. Assured by the surgeon that she would not suffer any permanent scarring, the claimant booked the surgery. Again, when the claimant was admitted to the clinic she was assured that there would not be any visible scarring on her face. As soon as she recovered consciousness after the operation the claimant noticed she was suffering from severe swelling in her face as well as a large amount of pain. Very soon after, she noticed that the results of the surgery were not as described or as promised to her. A few days later, the wounds around the claimants’ eyes opened. Two months after the surgery, the claimant was also left with scarring above her ears. The claimants’ eyes also became puffy with puckering at their edges. A lump also appeared on the side of the claimants face. After four months, the claimant started facial scarring treatment to rectify her various injuries. Her treatment included several subsequent operations to correct the scarring. Despite having extensive surgery and treatment, the claimant was left with permanent scarring behind both of her ears, as well as puckering and swelling around her eyes. In addition to the physical injuries, the claimant was left with depression and required medication for this.she was unable to return to work. The claimant was left with permanent scarring and was informed that her treatment would take a long time to produce results. She was also informed that she would need further surgery to continue to correct the mistakes left by the initial surgery. Solicitors acting on behalf of the claimant alleged that the surgeon had performed the surgery in a negligent way, leading to her facial scarring injuries. It was alleged that the surgeon had failed to advise the claimant that there would likely be scarring from her operation. It was also alleged that the facelift was performed in a substandard way and not as the claimant expected. The allegation also held that the claimant was claiming for stitches being applied incorrectly. The allegation also stated that the surgeon had failed to correct their mistakes and held that the claimant should have been referred to a surgeon with better experience after the initial corrective surgery was a failure. The allegation stated (using supporting medical evidence) that the claimant was left with permanent facial scarring as well as psychological injuries. The claim also stated that the claimant would still require further, future surgeries. Whether you are claiming compensation for an injury suffered as a result of an accident which was not your fault or seeking other legal services, hiring a solicitor in the UK can be expensive if you have to make upfront or ongoing payments. No win no fee contracts were designed to help people who need to hire a solicitor in a personal injury compensation case, but who can not afford upfront costs. They can help people to make a claim if they can not afford their legal costs or other fees. No win no fee contracts are the common name for conditional fee agreements, also known as CFA’s. They are a special type of contract which is drawn up between the solicitors (or legal firm) and the claimant. It will set out their relationship and the conditions under which the services are provided. No win no fee contracts are intended to ensure that those who can not afford to make any upfront payments don’t have to do so. If the solicitors are not able to recover the damages estimated, a fee is not charged. If they do win the case on behalf of the claimant, the solicitors fees can be deducted as a part of the compensation claim. With our no win no fee contracts there is no small print and there are no hidden costs. At Legal Expert we offer clients a no win no fee contract as part of our comprehensive legal services package. Your contract will set out exactly how and when your solicitor will be paid, as well as how the fee will be calculated if your case is successful. View our guide to no win no fee compensation claims here to find out more about making these kinds of claims. Contact the team at Legal Expert today to find out how our team of specialist legal solicitors can start helping you to claim the compensation you are entitled to after an accident or injury which was not your fault. Our professional team can start helping you today, whether your injuries were psychological or physical. You can talk to Legal Expert on the phone by calling 0800 073 8804 or by emailing our team on info@legalexpert.co.uk. You can also contact our team using our chat feature. Information and advice on the treatment of facial scarring with this guide from the NHS. Visit our scar compensation calculator to find out how much is a scar worth UK, as well as information on how to make a successful compensation claim.